Sweet StackersTM – a resolution to a food storage problem! Sweet Stackers convert your air-tight containers to multi-level using reusable, stackable corrugated plastic trays. 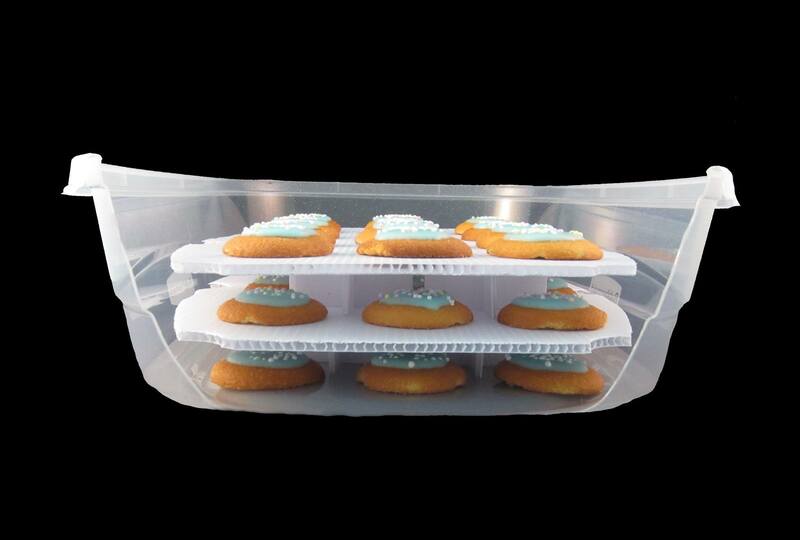 Visit my website http://sweetstackers.com for more information about our product, get more ideas on how to use our product or find the right size trays that will fit a plastic storage container that you already own! My family bakes Kolacky/Kolaches, a fruit filled cookie/pastry. We make them for most holiday desserts. They are pretty easy to make, bite-size and they freeze nicely in a plastic storage container. We usually make them a couple of weeks before a major holiday (like Christmas/Easter) so we can concentrate on cooking the main dinner. The problem is storing them without messing up the fruit filled top of the kolacky. We were storing them in separate containers and you could only imagine how much space that took up on our counter top or in our little freezer! I decided to design a way to safely stack a whole batch of kolacky in a plastic storage container that I already own. Surprisingly, I found that I was using my first prototype all of the time in my kitchen for a variety of reasons: from icing cut out sugar cookies for my kid’s birthday parties, transporting appetizers to a friend’s house, freezing berries or veggies to storing left-over pizza in my refrigerator without a soggy, sticky mess.